River cruising in Europe is on a roll, mostly on the Rhine and Danube with convoys of large vessels sailing Amsterdam to Budapest and beyond. But there are other routes, such as the River Douro in Portugal, and a charismatic shipowner there has just introduced three beautiful vessels using movie stars Sharon Stone and Andie MacDowell to get worldwide attention. The Douro, famous for its port wine, flows into the Atlantic Ocean at Porto, about three hours north of Lisbon, and it was in this spectacularly beautiful city that the AmaVida and Queen Isabel (on charter to Uniworld) of DouroAzul were christened by the actresses. Also there, on a night worthy of anything Hollywood can produce, were Rayney Qualley, daughter of Andie MacDowell, and singer/composer Michael Bolton – the latter entertaining a black-tie crowd to several of his hits. What they did not see was the third addition to DouroAzul’s fleet, the Spirit of Chartwell, which lay regally aloof across the river. This vessel, lavishly decorated with golden mermaids, was used by Queen Elizabeth for her stately procession down the River Thames in London as she celebrated her diamond jubilee. AmaVida and Queen Isabel are no less impressive, both opulent in their finish and featuring floor to ceiling windows, balcony cabins, top-deck heated pools and heli-pads. Andie MacDowell had earlier taken a helicopter tour of the vineyards and was clearly impressed. Heli-excursions will be offered on excursions this summer. And unlike some very large river cruisers, these sleek riverboats are a modest size – 59 and 54 cabins. Spirit of Chartwell, with only 14 cabins, will be DouroAzul’s flagship and most expensive ticket. 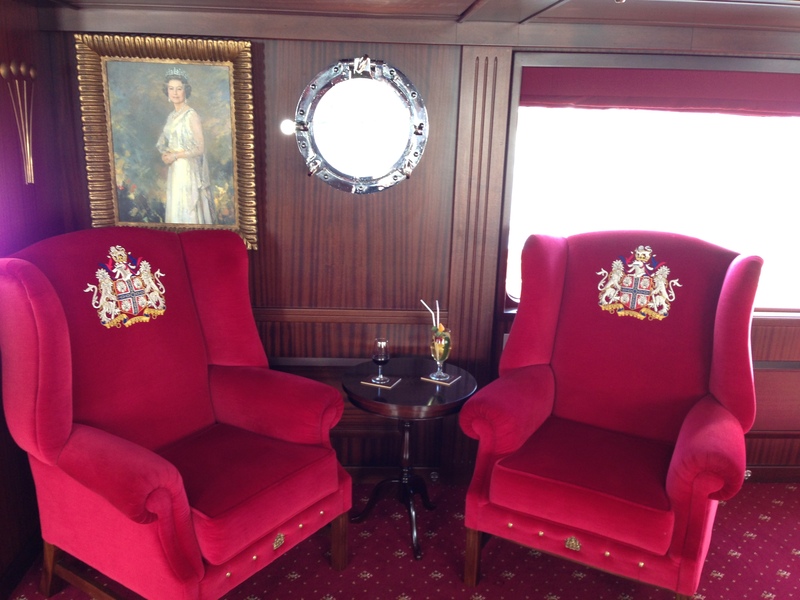 The lounge area features two splendid, red armchairs (bought from Harrods) with embossed coats of arms, and located beside a painting of Queen Elizabeth. They are going to be the most prized places to sit – on any riverboat, or ship on the high seas!